Long before Doug Williams became a hero to Washington Redskins fans and an inspiration to African-Americans in a groundbreaking Super Bowl win, he was already a star quarterback at Grambling State University. After his historic playing career ended, Williams then coached his alma mater to championships. Later, he was a scout and a player-personnel executive. And today, Williams is a high-ranking NFL team official. At every stop along his football journey, Williams has displayed the same dignity he showed in the week leading up to the 1988 Super Bowl. He’ll forever be revered by black folks for shattering the racist myth that African-American passers lacked the intellect, skills and heart to win at the sport’s highest level. But Williams is much more than merely the first African-American quarterback to start in a Super Bowl and be selected the game’s MVP. He’s a leader who is acutely aware of his place in black history and strives each day to honor the people who paved the roads he walked. Thirty years ago, Williams uplifted an entire race. He threw four touchdown passes as part of a 35-point, 356-yard second quarter – the highest-scoring quarter in NFL postseason history – in the Washington Redskins’ 42-10 Super Bowl victory over the Denver Broncos. Under an intense spotlight before the game because of his race, Williams handled the pressure deftly and produced spectacularly. Joe Gibbs remembers. The Hall of Fame head coach orchestrated the Redskins’ offense that day in San Diego, calling the plays that Williams directed so well during the Redskins’ stunning second-quarter run. Williams, however, was keenly aware of the situation. He knew many would view his performance as a litmus test for the competence of all black quarterbacks. Of course, it would be grossly unfair to judge everyone of a particular race on how one individual fared in one task on one given day. But to that point in the NFL, black passers generally hadn’t been treated fairly. Williams’ signature accomplishment as a quarterback was especially important for other black men who played football’s most important position. For 10 years, Jason Campbell was an NFL signal-caller. A former first-round draft pick of the Redskins, Campbell relied on Williams’ counsel throughout his career. “The thing about Doug is, he went through so many tough times and he still got to the top in this game,” Campbell said. “Doug made it to where I was hoping to go in my career, so why wouldn’t I talk to Doug about how to try to get there? At the lowest point of his life, Marlin Briscoe, the first African-American quarterback to start in the game’s modern era, found hope while watching Williams torch the Broncos. It was fitting that Williams broke through one of the game’s toughest barriers. After a stellar career at Grambling, Williams also was the first African-American quarterback to be selected in the first round of the NFL draft post-merger. Williams learned a lot from legendary Grambling head coach Eddie Robinson – especially about life as a black man in America. “You have to understand: I went to Grambling. I played for Eddie Robinson,” said Williams, who succeeded his mentor at Grambling. “When it comes to blacks and whites and history, I understand about that. In a different era, Williams also drew the nation’s attention. And he delivered a knockout, too. 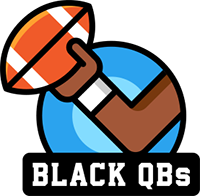 The Undefeated profiled 30 black quarterbacks leading up to the 2018 Super Bowl, which marked 30 years since Doug Williams became the first black quarterback to win the big game.